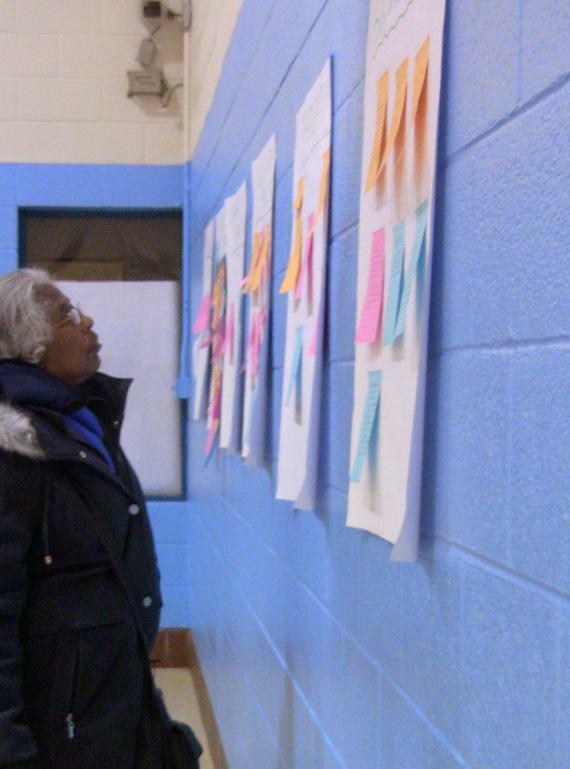 Evanston resident Priscilla Giles looks at comments concerning participant's concerns about existence of racial tension in city institutions in the third dialogue on race the city has hosted. Evanston residents discussed racism in education, law enforcement and other institutions Thursday at the last of three dialogues on race hosted by the city. The city hosted the series of discussions, called “My Evanston, My Neighbors: Constructive Dialogues on Race, Understanding and our Hopes for Evanston,” after a concerned citizen approached Mayor Elizabeth Tisdahl about the issue of race, said Godwin Chen, the dialogue organizer. About 70 Evanston residents broke off into discussion groups to share stories about their experiences with racism in various institutions. Topics shared ranged from concerns about racial profiling by police, a lack of diversity on local school boards, as well as Northwestern’s role in addressing the issue of race. Weinberg junior Danya Sherbini, who attended the dialogue, said NU students should increase their awareness of city concerns. “As an NU student you will not always see the other side … we are kind of in our own NU bubble, and I thought it would be cool to see what is going on in this city,” Sherbini said. Participants raised concerns over the lack of diversity among school board members in Evanston-Skokie District 65. Some argued the makeup of the school board is not representative of student demographics. Ald. Delores Holmes (5th) said she needs to balance her role as a city official with her desire to support diversity on the boards. Evanston resident Maria Flynn said she is concerned about how schools admit students into the D65’s Two-Way Immersion program, which provides instruction in two languages. Some Latino parents have contested the program, arguing their children would be better served in English-only classrooms. Toward the end of the meeting, organizers encouraged residents to discuss solutions to alleviate the city’s racial tensions. Residents appeared hesitant to address issues that Jean-Baptiste called embedded in American institutions. Holmes proposed residents join neighborhood watch groups to learn more about their community and contribute to a safer environment. But Evanston resident Tressa Randolph was skeptical of the proposal. Tisdahl said the city’s human relations committee will organize future dialogues on race. Committee chair Tonya Patterson said members will incorporate suggestions raised at the dialogues into an action plan. “We are taking a lead on it, but it will take the efforts of the community to make it work,” Patterson said.